That we are called to be disciples is without question, how we go about it can be the difficult part. When I think about what the real purpose of the Office of Vocations, it is to help men and women who have realized through a growing awareness in their faith that they are “called” and in fact, having admitted that, now are readying themselves to live that out in the way particular and unique to each of them (us). Jesus sends out the disciples two by two. He gives them their “marching orders”. They take only the things they need for the mission and ministry they are now ready to do. In fact, this departure we have to remember is a “test run” because it’s what will prepare them for doing what they will do when the Lord ascends into heaven after the Resurrection. Over the last couple of months, I have been busy with some of my team in helping to prepare the Totus Tuus missionaries who have begun Week II in the parishes already. 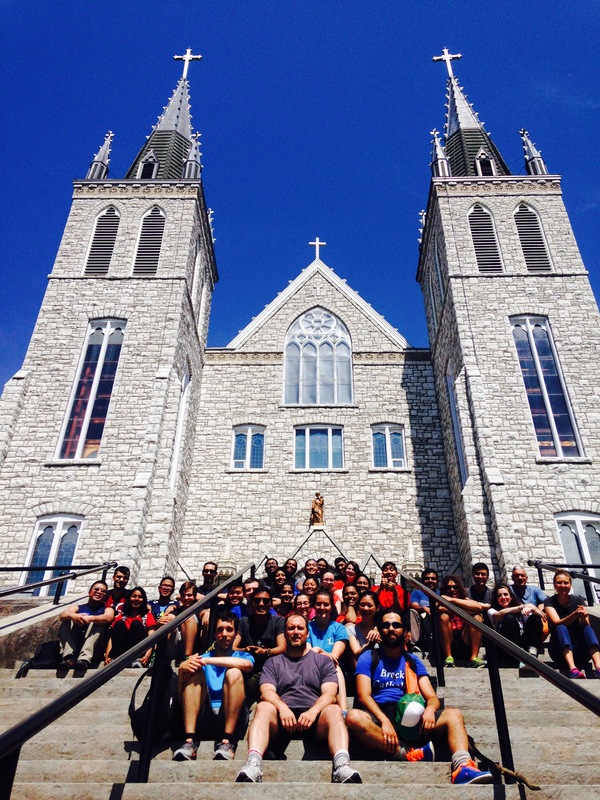 At the beginning of June we walked together 195 kms and through much of the northern part of the Archdiocese of Toronto where the Jesuit martyrs gave their lives for their faith in the 1600’s. Sts. Charles Garnier, St. Noel Chabanel, St. Jean de Brebeuf and St. Gabriel Lalemant died in Huronia, in the area around Martyr’s Shrine in Midland. We began in Brampton and reached Midland eight days later. Our 24 missionaries were tired and sore but with the others who joined us we were “on fire” when we arrived. A few days later we brought in the “best of the best” of Catholic teachers, apologists, catechists and witnesses to help teach our missionaries how to catechize the young people (Grades 2 to 12) they will work with throughout the summer. Several years ago, my predecessor, Fr. Hansoo Park put together a team of seminarians and staff and after spending time “learning the ropes” launched the Totus Tuus program here in the archdiocese. This year was my first year of involvement, and it has become now a partnership between the Offices of Vocations & Catholic Youth. Many people have asked me why Totus Tuus would have anything to do with vocations, and have told me that I might be better focusing on “other things”. My answer to this is the point of reflection for today. These missionaries, inspiring young Catholic university students have spent an intense period of time with our Lord Jesus as they prepared themselves for this part of their mission. It too is kind of a “test run”; a test run of what they are called to do with their lives. Some will discern God’s will for them is the priesthood or religious life. Others will discover they are called to marriage and to find a way to give themselves totally and completely for God and for others. No matter exactly what it is, they are called to discipleship and the Lord is showing them the way. They are living simply and powerfully for God’s purpose and their meaning within that. This is why the Office of Vocations remains committed to Totus Tuus and these special disciples. They are coming to discover that which is not easy to discover what God has in store for each of them. In the coming weeks, I hope to share more with you, or have the missionaries share something with you on the “Come, Follow Me” blog. In the meantime, as we consider our own intentional discipleship may we be inspired by the Lord who sent forth the first disciples and may we continue to pray for our own vocations and those of this year’s Totus Tuus missionaries. May God bless you.